It’s mushroom hunting season and you may be thinking that you’ll give it a go. Read this first and then if you’re still gung-ho, forage with my blessings. Rule #1 – Learn the BC poisonous mushrooms first! 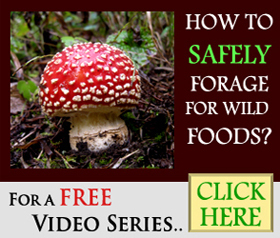 As a start, Check out our FREE Foraging for Beginners 3-Part Video Series here. There are 10,000+ species of mushrooms in BC, only a handful of these can be fatal if ingested, another group will make you barfy (more if you are like me a ‘canary in a coal mine’ type), 30+ mushrooms are on my ‘choice’ edibles list (lots that you will never see in the stores), but most mushrooms are innocuous. Within the 30 edibles, there are mushrooms like chanterelles (Cantharellus) and oyster mushrooms (Pleurotus) that are very easy to identify, stick to those! Mushroom foraging is like an adult treasure hunt. It’s so exciting finding buckets of wild mushroom that cost $30/lb in the grocery store, that it’s easy to get ‘experimental’. Here are some tips to keep you safe. Get to know a mushroom for a year before you eat it. You wouldn’t marry a guy after a first date, would you? When you are 100% sure of that chanterelle you’re holding, then take a small piece, cook it and eat it. Wait for a week and make sure you are not allergic to it or have mis-identified it. Then you can be confident next year when you see those orange beauties popping up in the same area that you can eat them. Make sure you see the mushroom you are identifying in multiple stages of growth to help you with identification. Colour of the mushroom can vary widely due to environment, soil pH etc. So use your eyes with a grain of salt. Your nose is frequently a better gauge for culinary mushrooms. A small % of people are sensitive to wild mushrooms and can get indigestion even with edibles that you may have no problem with. Warn your guests that this is a risk before serving them your bounty and keep your friends longer. Some amanitas are edible… I avoid all amanitas just to be very, very safe. Can look like a white puffball (edible) in it’s ‘baby’ mushroom stage. Don’t eat puffballs if you’re worried about confusing them. Easy! Amanita smithiana (has been known to have a tapering base occasionally), pantherina and silvicola are other amanitas that are toxic and some have been confused for matsutake (pine) mushrooms which are a choice edible. 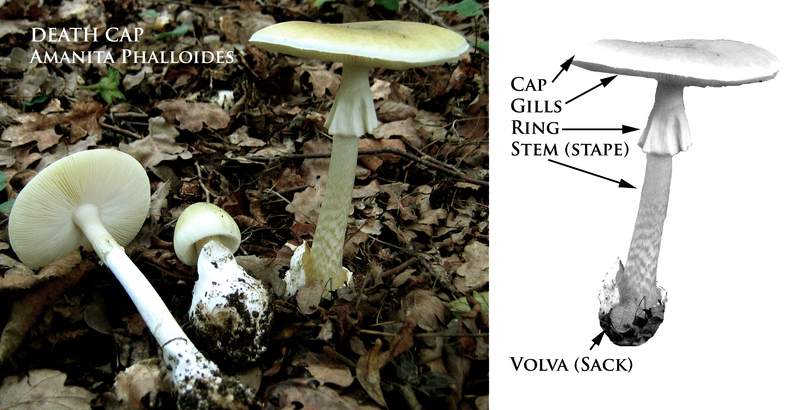 Both are mostly white with the Death Cap sometimes having a dull yellow to olive green cap. Can have a mild, even sweet, flavour, anise scent… don’t always trust your nose. Amanita rubescens/franchetii – Just avoid the Amanita family is my rule of thumb. Pleurocybella porrigens – Angel wings are an issue if you have pre-existing kidney disease and are already receiving dialysis treatment… not a worry for most people. Tricholoma equestre/flavovirens – Man on horseback is edible, but some people have been known to be allergic to it. False Morel (Gyromitra esculenta)- Can cause death, it’s like ingesting rocket fuel. Leccinum spp. (Scaber Boletes) – I avoid this family even though there are edibles within it. Morchella family mushrooms eaten raw can cause stomach issues. Alcoholic Inky caps – Coprinus atramentarius – Inky Cap Family – Only causes stomach upsets if you drink alcohol up to 5 days after eating them! Non-fatal, but can be confused with edible Shaggy manes. You can handle poisonous mushrooms (even the death cap) with no ill effects, just wash your hands after to be extra cautious. David Arora’s – All that the rain promises and more is a great handbook to give you more information on specific Pacific Northwest mushrooms. I can’t find a single, useful sight that helps me, right NOW, identify the mound of mushrooms I found a week ago in my yard. I’ve contacted 2 mushroom people who have not gotten back to me, very annoying. I guess my best bet is to buy a field guide and worry about foraging for mushrooms next year. If you live in Vancouver, you could come out on one of our introduction to mushroom foraging trips this fall, (weekends) that’s the best suggestion I have for beginners. There thousands of species of mushrooms, so IDing one just from a photo can be really difficult. Mushroom books are great, but nothing is better than being in the field with a guide. I would be interested in tagging along on a foraging trip. Can you email me with some detail? is there any other mushroom that looks luke Shaggy Mane that might be poisonous? No, they are very distinctive looking. Whatever mushroom I have growing in my backyard, what is the best way to remove them permanently? It’s really hard to get rid of fungi permanently and actually really detrimental to your garden/tree health. Mushrooms are an important part of the ecosystem of anyone’s backyard. Without mycelium (the underground portion of the fungi), soil doesn’t function and nutrients aren’t dispersed to trees/plants. I would advise a control method if you are worried, just remove the mushrooms as they fruit, that way you maintain the soil/ecosystem health and you can feel safer about your yard. Or even better, get the mushrooms that are growing in your yard identified so that you know if you have anything to worry about. There are very, very few mushrooms that can cause you any harm. Find a local mycological society (mushroom club) to help you with the ID’s, or if you are in Vancouver, come out on a mushroom tour and bring any mushrooms from your yard as samples for me to help you with. Destroying angel (A. ocreata) is found in BC. They grow on my property. 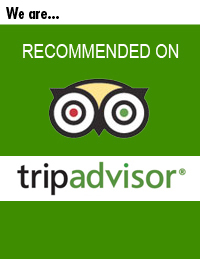 Previous Entry: Where to find Porcini ( King Bolete ) in BC? Next Entry: The weirdest mushroom in BC? Edible Lobster Mushrooms!